A single-tooth dental implant can make a big difference in your mouth. A missing tooth can impact how you eat and drink, and how you talk. It can lead to embarrassing photos and a lack of confidence about your smile. In short, a missing tooth is no fun. Now, you can benefit from some of the newest dental technology and get a solid, long-term replacement for a missing tooth. Maybe you had a lot of tooth decay, and eventually had to remove the tooth with an extraction. Sometimes over time even a root canal and other maintenance just don’t work, and a tooth has to be extracted. Maybe an impact led to a tooth being unsalvageable. In any case, single-tooth dental implants can help you to make your smile whole again, and allow you to live a better quality of life. The benefits of dental implants are more than just cosmetic: having a whole set of teeth is healthier, and can impact the way you chew, floss and brush, impacting your overall dental health. Dental implants are a permanent solution to missing teeth. 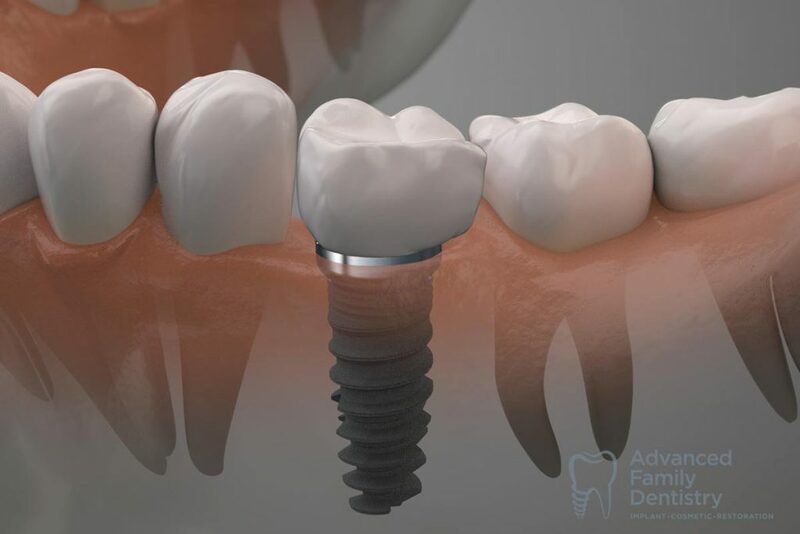 Unlike dentures and bridges, dental implants are attached directly to the jawbone with something called an abutment. After recovery and healing, the dental implant will be just like a new tooth. Traditionally, dental implants required several stages. The first would be consultation, and successive stages would involve a surgery to place implant infrastructure under the gum line. After that implant bonds with the jawbone, an oral surgeon would add the rest of the tooth on this foundation. However, single-tooth implant processes have evolved in the past few years. In some cases, a provider can put in a single-tooth dental implant with one procedure – or even during tooth extractions. That really cuts down on the time and process requirements, but even if the dental implant requires more than one stage, it’s really worth it for many patients who will not have to worry about follow-ups for a dead or compromised tooth. After a single-tooth dental implant, some recovery is required. You’ll be able to eat soft foods fairly early, but it may take some time to fully assimilate your new dental implant into your smile. Dr. Kim can provide details on everything that you should know before, during and after a dental implant, with attention to each patient’s health needs. Costs of single-tooth dental implants typically range in the thousands of dollars. However, some forms of insurance pay toward these kinds of restorative procedures, and patients can get financing to help spread the costs out over a period of time. Dr. Sonny Kim is an experienced oral surgery specialist offering high-quality dental care to patients with the most advanced dental technologies on the market. We will provide full consultation and guidance through a single-tooth dental implant process and help you to make the most of your investment in your smile, checking up and following up as you move toward a safe and comfortable recovery.